What is Leadership Success & How Do I Get More of It? Improve communication, energy, and commitment. Have you ever hired the wrong person and lived to regret it? three biggest mistakes interviewers make. It’s not easy to build a great team. You have to hire the right people and give them the coaching and training they need to succeed in their roles. Having the right people in the job and on a team makes all the difference. Take advantage of our powerful tools that take much of the guesswork out of the selection process. Nobody’s perfect. Bring out the best in your people. Address challenges and develop their strengths by providing them with coaching in the areas where they need help and guidance. You can’t expect people to do a job well if they don’t know how to do it… and that includes leadership. Our targeted training brings people up to speed fast and gets results.. The art and science of bringing the best of who you are to everything you do to create a rich and satisfying career and life. And as you Wake Up Eager you naturally have the energy and ability to help everyone around you bring the best of who they are, to what they do. "We've seen less turnover, better employee retention and everyone is happier. The (PPD Superior Performance) Hiring Process saves us time in the long run." "Suzie was an excellent choice as a keynote speaker for our Small Business Conference. In addition to captivating the audience with examples and stories, she kept them engaged with one another by encouraging group participation and mini-discussions to foster additional networking opportunities for our attendees. Her insight on motivating yourself and others in the workplace is a crucial message to hear for businesses of all sizes, and would be beneficial for everyone from the front line employee to the C-suite." "It is rare that you come across a standout talent like Suzie. I had the privilege of attending a few of her workshops and she is by far one of the most dynamic facilitators I have met. I was impressed by Suzie’s ability to handle some of the most diverse individuals effortlessly. Her experience shows as she is able to command a room, interact and engage all personalities. In addition to her impressive background, Suzie is perceptive, approachable, ambitious and empathetic. She is one of a kind." "Another exceptional program! You are terrific! The class absolutely adored your manner and class. Looking forward to our continued partnership in our Senior Leadership course and the other venues you have supported within FlightSafety." "Suzie, I didn't want to let the week go by without saying how much I appreciated your being here. I don't think there was a single person who did not greatly benefit from your 2+ hours of "meaty" material. As I told you, just holding this group's attention on day three, and at the end of several gruelling days of work, was not an easy task. But they were engaged and participated far beyond my expectations. I truly believe it's due to your A+ delivery, easy going (and humorous) nature and of course, the richness of the content. The informal feedback I got from everyone was excellent, Suzie; I wanted to be sure you knew that! Thank you for your expertise, for your outstanding session and for helping us raise the bar on our interviewing skills. I hope to see you soon." 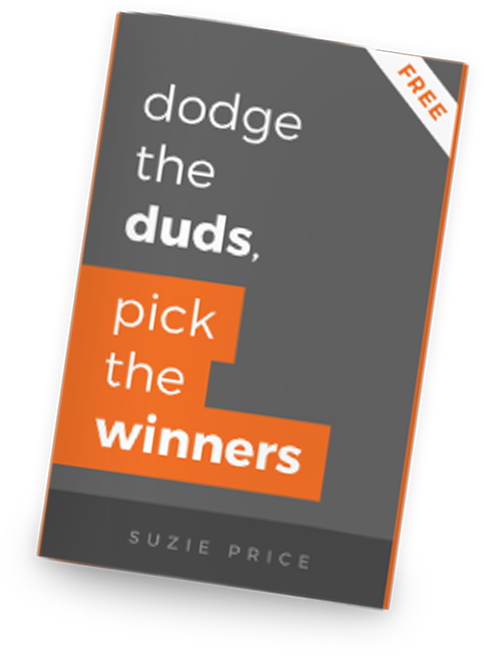 "We had Suzie come out to speak to our organization about "Dodging the Duds." Her presentation was eye-opening, entertaining, engaging, and presented some incredibly practical advice about improving the way we go about hiring people for our companies. I took away a number of steps that I could put in place immediately at absolutely no cost to my company. Suzie is a great speaker, and I would highly recommend her to your company to help increase efficiency in your personnel. She will bring to the table plenty of tools to help you improve your bottom line!" "Thank you so much for all your help last week. You added a high level of professionalism and respect to an otherwise unpleasant process for all involved. We greatly value your services and moral support!" "Suzie, Thank you so much for facilitating the GTC group last week. You did an incredible job as usual. Your skill and competence are outstanding and your warmth is impactful. It is a joy and honor to work with you." "We had an epiphany during the sharing exercise. We both realized why we've been at odds with each other, we each needed different things from each other. We now understand how to work together more effectively. This has been so helpful to our creating an effective working relationship."